Always look behind, you never know what could happen. I expect a battle to the end. They are everywhere, attacking and covering my territory. They try to take over every year, but I have fought them off with persistence and bravery. Jut look at them, waiting to pounce, continuously changing their colours. The worst are the yellow troops. They are the front line, those that come first to spy out the land and watch for guardians like myself. They pretend to die, but only lay and wait. As soon as a breath of wind arises, they rise again for an attack. Those that surround me are my victims. I fought them until they submitted to my claws, my talons of death. I pierced them, but they did not bleed. They have assumed supernatural powers, and have now entered a state of dehydration, but I will not be fooled. Next year they will return in their old shape and form. Come closer and you will see the dead remains of my conquests beneath my paws. I am observant, and keep an eye of their development, but I am alone in my battle. I must make my conquests alone. But wait, Mrs. Human is approaching, will she assist in my battle against the evil doom awaiting us all? We have them all over the house here, too. They cling to the dogs coats and they apparently like rolling in them, so there are whole ones and crushed ones and little pieces of fall all OVER the place. I live i hopes of cleanliness, but with three dogs, it’s nothing by a dream. They are taking over and slipping inside when you are not watching. 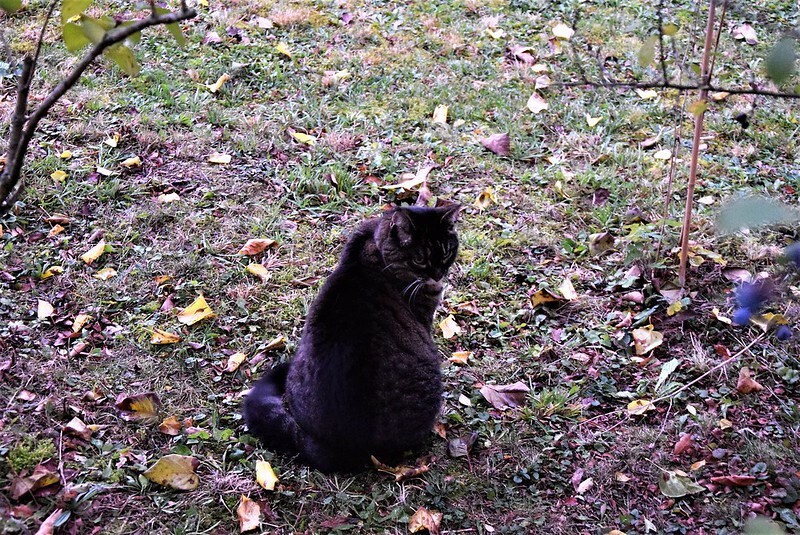 Tabby tells me I should install a leaf warning system. She said they felines are working on it. Be careful Dusty, never trust a leaf soldier. They are indoctrinated to infiltrate homes, to slip into secret spaces and watch your movements. They could attack when you are sleeping and you could find them in your kibble. They are not dead, just playing with you. If you see them fall from a tree, pounce immediately and count to nine, if they stop breathing you have been successful. Meow Martha. Yes I confirm I know I am a pretty feline, but you may say it again and again, I like to hear it.